· Prevalence: Atrial fibrillation (AF) is the most common sustained arrhythmia that one encounters in clinical practice. It accounts for approximately one third of all hospitalizations from cardiac arrhythmias. In the general population, approximately 2.2 million Americans or <1% have AF; however, the prevalence varies according to the age group and is higher in the elderly. o AF is rare in children and young adults. o It is also rare in individuals younger than age 60 years because <1% of the population in this age group has AF. o It increases to more than 8% among patients older than 80 years of age. o The median age of patients with AF is approximately 75 years. · Electrocardiogram (ECG) findings: AF is a common cause of stroke in the elderly. AF therefore should be recognized because the risk of stroke can be minimized if the arrhythmia is treated appropriately. The following are the ECG features of AF. o Presence of very irregular and disorganized atrial activity represented in the ECG as fibrillatory waves. These fibrillatory waves, also called “F” waves, are due to several independent reentrant wavelets within the atria (Fig. 19.1). o The fibrillatory waves may be fine or coarse and have varying morphologies, which can be mistaken for P waves. o Fibrillatory waves may not be present. Instead, a flat line with irregularly irregular R-R intervals may be present. o The atrial rate in AF is ≥350 beats per minute (bpm). o The ventricular rate is irregularly irregular and depends on the number of atrial impulses conducted through the atrioventricular (AV) node. o The QRS complexes are narrow unless there is bundle branch block, aberrant conduction, or preexcitation. Figure 19.1: Atrial Fibrillation. Rhythm strip showing atrial fibrillation. Note the presence of fibrillatory waves (arrows) between irregularly irregular R-R intervals. · Atrial rate: There are no distinct P waves in AF. Instead, fibrillatory or F waves are present with a rate that exceeds 350 bpm. The F waves vary in size and shape and may be coarse or fine or, in some instances, it may not be visible in any lead of a complete 12-lead ECG. When fibrillatory waves are not visible, the diagnosis of AF is based on the presence of irregularly irregular R-R intervals as shown (Fig. 19.2B). · Ventricular rate: The ventricular response during AF is irregularly irregular and the rate will depend on the state of the AV node. When there is heightened parasympathetic activity or AV nodal disease, the ventricular rate may be very slow. Conversely, when there increased sympathetic activity, the ventricular rate may be very rapid. Because the ventricular rate in AF is irregularly irregular, the heart rate should be calculated using a long lead rhythm strip rather than using only the distance between two QRS complexes, as shown in the following section. o Six second time lines: If 3-second time lines are present in the ECG monitor strip, 6 seconds can be easily measured. This is equivalent to 30 large blocks in the ECG paper (Fig. 19.3). The number of QRS complexes are counted inside the 6-second time line and multiplied by 10 to give the heart rate per minute. The first QRS complex is not counted because this serves as baseline. o Ten seconds: If the heart rate is very slow, a longer interval such as 10 seconds is measured. This is equivalent to 50 large blocks (Fig. 19.4). The number of QRS complexes counted within the 10-second interval multiplied by 6 is the heart rate per minute. Again, the first QRS complex is not counted. Figure 19.2: Atrial Fibrillation. Two different ECGs are shown. (A) AF with fibrillatory waves in V1 and in several other leads marked by the arrows. (B) Twelve-lead ECG from another patient with AF showing absence of atrial activity with virtually no fibrillatory waves in the whole tracing. The diagnosis of AF is based on the presence of irregularly irregular R-R intervals. AF, atrial fibrillation; ECG, electrocardiogram. · The ventricular rate during AF can be slow or rapid as shown in Figs. 19.5A-E. When the ventricular rate is slow (Figs. 19.5A-C), AF can be easily recognized. However, when the ventricular rate is faster (Fig. 19.5D,E), AF is more difficult to diagnose because the QRS complexes are clustered together and the undulating baseline and irregularly irregular R-R intervals become more difficult to evaluate. Figure 19.3: Six-Second Markers. Thirty large blocks is equivalent to 6 seconds. In this example, there are 10.5 QRS complexes within the 6-second time markers, thus the heart rate is 10.5 × 10 = 105 beats per minute. · Classification: AF may be classified according to its clinical rather than its electrocardiographic presentation. The American College of Cardiology/American Heart Association Task Force on Practice Guidelines, and the European Society of Cardiology Committee (ACC/AHA/ESC) 2006 guidelines for the management of AF identify several types of AF. o Nonvalvular AF: AF is considered nonvalvular when it occurs in the absence of rheumatic mitral valve disease, prosthetic heart valve, or mitral valve repair. o Valvular AF: AF is considered valvular when it is associated with rheumatic mitral stenosis, prosthetic heart valve, or the patient has previously undergone valve repair. o Lone AF: AF occurring in individuals _60 years of age with structurally normal hearts and no evidence of pulmonary disease. These individuals are not hypertensive and have no clinical or echocardiographic evidence of cardiac or pulmonary disease. These patients are important to identify because they are low risk for thromboembolism. o First detected: As the name implies, AF is detected for the first time, regardless of duration or previous episodes. A number of patients with first-detected AF have the potential to revert to normal sinus rhythm spontaneously. o Recurrent: AF is recurrent if two or more episodes have occurred. The AF may be paroxysmal or persistent. o Paroxysmal: When recurrent AF has sudden onset and abrupt termination. The episodes are usually self terminating lasting for <7 days with most episodes lasting <2 hours. o Persistent: AF is persistent if the arrhythmia is more than 7 days in duration. This also includes AF of much longer duration, including those lasting for more than 1 year. In persistent AF, the episodes are no longer self terminating, although the AF can be terminated with pharmacologic agents or with electrical cardioversion. o Permanent: AF is permanent if the arrhythmia can no longer be converted to normal sinus rhythm with electrical cardioversion or pharmacologic agents. The arrhythmia is usually persistent, lasting >1 year, or a previous electrical cardioversion has failed. · Associated diseases: The most common diseases associated with AF include hypertension, ischemic heart disease, heart failure, valvular diseases, and diabetes mellitus. · Mechanism: AF is a reentrant arrhythmia characterized by the presence of multiple independent reentrant wavelets within the atria (Fig. 19.6). The fibrillatory waves have a rate of >350 bpm. These fibrillatory waves are often precipitated by premature atrial complexes originating from the atrial wall or crista terminalis (Fig. 19.7). More recently, it has been shown that AF can also be initiated by repetitive firing of automatic foci within the pulmonary veins. These rapidly firing automatic foci may occur in one or more pulmonary veins. They cannot be recorded in the surface ECG, but can be recorded with intracardiac techniques. These ectopic impulses can also originate from large veins draining into the atria, including the superior vena cava and coronary sinus, and can precipitate AF when there is appropriate substrate for reentry. Figure 19.4: Ten-Second Markers. When the heart rate is very slow, 10 seconds is a more accurate marker. This is equivalent to 50 large blocks. In the above example, there are seven QRS complexes within the 10-second time marks. The heart rate is 7 × 6 = 42 beats per minute. Figure 19.5: Atrial Fibrillation (AF). AF is usually recognized by the irregularly irregular R-R intervals and undulating baseline. As the ventricular rate becomes faster (A-E), the R-R intervals become less irregular. The ventricular rate in rhythm strip (E) is so rapid that the R-R interval almost looks regular and can be mistaken for supraventricular tachycardia instead of AF. Figure 19.6: Diagrammatic Representation of Atrial Fibrillation (AF). AF is a reentrant arrhythmia characterized by the presence of multiple independent wavelets within the atria with an atrial rate of >350 beats per minute. These reentrant wavelets can be precipitated by ectopic impulses originating from the pulmonary veins as well as other large veins draining into the atria. · Atrial fibrillation can be mistaken for supraventricular tachycardia: As previously mentioned, when the ventricular rate is unusually rapid, the R-R interval may look regular because the QRS complexes are clustered very close together. Thus, AF with a very rapid ventricular rate can be mistaken for supraventricular tachycardia (Fig. 19.8). The diagnosis of AF can be ascertained by slowing the ventricular rate with vagal maneuvers such as carotid sinus pressure. When carotid sinus pressure is applied, an irregularly irregular R-R interval with fibrillatory or undulating baseline can be demonstrated between the QRS complexes (Fig. 19.9). Figure 19.7: Premature Atrial Complex (PAC) Precipitating Atrial Fibrillation. Rhythm strip showing a single PAC (arrow) precipitating atrial fibrillation. The rhythm strips are continuous. · AF can be mistaken for multifocal atrial tachycardia: The fibrillatory waves, especially when they are coarse, may be mistaken for P waves. Some of these fibrillatory or “F” waves may be inscribed before the QRS complexes. When this occurs, AF may be mistaken for multifocal atrial tachycardia (Fig. 19.10). In multifocal atrial tachycardia, anticoagulation is not necessary because this arrhythmia is not associated with increased risk of thromboembolic events, whereas in AF, anticoagulation is standard therapy for the prevention of stroke, especially in high-risk patients. · AF may be diagnosed even when fibrillatory waves are absent by the irregularly irregular R-R intervals (Fig. 19.11). However, in patients with permanently implanted ventricular pacemakers (Fig. 19.12), patients with complete AV dissociation (Fig. 19.13), or complete AV block (Fig. 19.14), the R-R intervals may become completely regular. If there are no fibrillatory waves present, the diagnosis of AF may be missed completely. Patients with unrecognized AF are at risk for stroke as these patients will not be treated appropriately. Figure 19.8: Atrial Fibrillation with Rapid Ventricular Response. When the ventricular rate is very rapid, the irregularity in the R-R intervals may not be obvious. The arrhythmia can be mistaken for supraventricular tachycardia especially when F waves are not grossly apparent. Note, however, that the R-R intervals are not regular. Carotid sinus stimulation may be helpful in establishing the diagnosis. · AF with regular R-R intervals: The ventricular rate in AF is irregularly irregular. The ventricular rate can become regular when there is complete AV dissociation or complete AV block. o Complete AV dissociation: AF with complete AV dissociation is frequently due to digitalis toxicity. Digitalis blocks the AV node and excites the AV junction and ventricles resulting in junctional or ventricular ectopic rhythms. AF with an irregularly irregular R-R interval that suddenly becomes regular may be due to digitalis toxicity (Fig. 19.13). 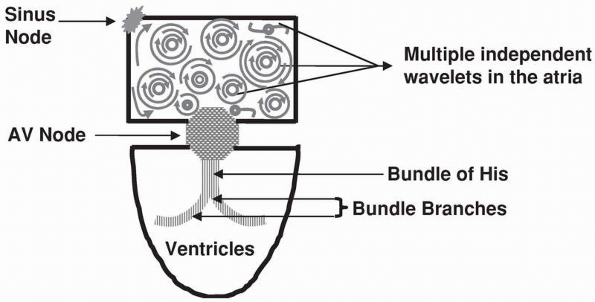 In complete AV dissociation, the ventricles are no longer controlled by the AF, but rather by a separate pacemaker, usually the AV junction with a regular rate that exceeds 60 bpm. Figure 19.9: Carotid Sinus Stimulation. The rhythm looks regular and can be mistaken for supraventricular tachycardia. When the diagnosis of AF is in doubt, carotid sinus stimulation may be helpful in differentiating AF from other narrow complex supraventricular arrhythmias. Carotid sinus stimulation (arrow) causes slowing of the ventricular rate resulting in prolongation of the R-R interval. This will allow identification of a wavy baseline representing the fibrillating atria. AF, atrial fibrillation. Figure 19.10: Atrial Fibrillation (AF). The coarse F waves may be mistaken for P waves (arrows) and AF may be misdiagnosed as multifocal atrial tachycardia. Figure 19.11: Atrial Fibrillation (AF). Even in the absence of fibrillatory waves between QRS complexes, AF may be diagnosed by the irregularly irregular R-R intervals as shown (above). However, when the R-R intervals are regular (below) the diagnosis of AF may be difficult. Figure 19.12: Atrial Fibrillation. The presence of atrial fibrillation may be difficult to diagnose in a patient with a ventricular pacemaker if there are no fibrillatory waves in baseline electrocardiogram as shown. The presence of atrial fibrillation was suspected only after the patient sustained a transient ischemic attack. Figure 19.13: Atrial Fibrillation (AF) with Complete Atrioventricular (AV) Dissociation. This patient with known chronic AF suddenly developed regular R-R intervals because of AV dissociation. When the ventricular rate in atrial fibrillation suddenly regularizes, the etiology is usually digitalis toxicity. 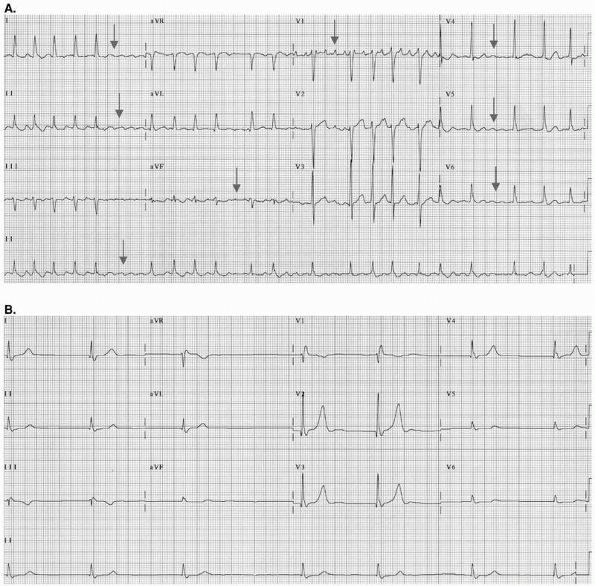 Figure 19.14: Atrial Fibrillation (AF) and Complete Atrioventricular (AV) Block. The rhythm is AF although the R-R intervals are regular. The QRS complexes are wide with a very slow rate of approximately 33 beats per minute. The rhythm is AF with complete AV block. o Complete AV Block: When there is complete AV block, the atrial fibrillatory impulses will not be able to conduct to the ventricles. An AV junctional or ventricular escape rhythm usually comes to the rescue; otherwise, the ventricles will become asystolic. In complete AV block, the ventricular rate is slow and regular usually in the mid to low 40s (Fig. 19.14). · Aberrant ventricular conduction mistaken for premature ventricular complex: Premature atrial impulses are normally conducted to the ventricles with narrow QRS complexes very similar to a normal sinus impulse. If the impulse is too premature, it may find one of the bundle branches still refractory from the previous impulse and will be conducted with a wide QRS complex. These premature atrial impulses that are followed by wide QRS complexes are aberrantly conducted impulses, which can be mistaken for premature ventricular complex. Aberrantly conducted atrial impulses usually have right bundle branch block configuration with rSR′ pattern in V1 because the right bundle branch has a longer refractory period than the left bundle branch in most individuals. Figure 19.15: Ventricular Aberration. Arrow pointing up shows an aberrantly conducted supraventricular impulse, which is the second QRS complex after a long R-R interval. Aberrantly conducted complexes are wide usually with a right bundle branch block pattern. The wide QRS complex can be easily mistaken for a premature ventricular complex. · Ashman phenomenon: In AF, the R-R intervals are irregularly irregular. Some R-R intervals are longer and other R-R intervals are shorter. When the R-R intervals are longer or the heart rate is slower, the refractory period of the conduction tissues becomes longer. When the R-R intervals are shorter or the heart rate is faster, the refractory period is shorter. If a long R-R interval is followed by a short R-R interval (long/short cycle), the atrial impulse may find the right bundle branch still refractory from the previous impulse and will be conducted with a wide QRS complex. This aberrantly conducted complex is the second complex (the complex with a short cycle following a long cycle), as shown in Figure 19.15. This variability in the refractory period of the conduction system during long/short cycles in AF is called the Ashman phenomenon. Figure 19.16: Atrial Fibrillation (AF) and Wolff-Parkinson-White (WPW) Syndrome. Note the presence of irregularly irregular R-R intervals with very bizarre QRS complexes because of AF with varying degrees of ventricular fusion. AF occurring in the presence of WPW syndrome may result in hemodynamic instability and sudden cardiac death due to ventricular fibrillation. · Atrial fibrillation and Wolff-Parkinson-White (WPW) syndrome: The most dreadful complication of AF can occur in patients with WPW syndrome (see Chapter 20, Wolff-Parkinson-White Syndrome). In WPW syndrome, an accessory pathway connects the atrium directly to the ventricles; thus, the atrial impulse can reach the ventricles not only through the AV node but also through the bypass tract. AF associated with a bypass tract can deteriorate to ventricular fibrillation and can cause sudden cardiac death (Fig. 19.16). o Unlike the AV node, which consists of special cells with long refractory periods, the bypass tract consists of ordinary working myocardium with much shorter refractory period. Thus, during atrial flutter (atrial rate ≥250 bpm) or AF (atrial rate ≥350 bpm), the rapid atrial impulses which are normally delayed or blocked at the AV node due to its longer refractory period, may be conducted directly to the ventricles through the bypass tract resulting in very rapid ventricular rate. o AV nodal blocking agents are standard drugs for controlling the ventricular rate in AF. These drugs are contraindicated when there is WPW syndrome because they enhance conduction across the bypass tract resulting in rapid ventricular rate and hemodynamic collapse (see Chapter 20, Wolff-Parkinson-White Syndrome). · Fibrillatory waves are present in baseline ECG representing disorganized atrial activity. · The R-R intervals are irregularly irregular. · The ventricular rate is variable and depends on the number of atrial impulses conducted through the AV node. In younger individuals, the ventricular rate is faster and usually varies from 120 to 150 bpm, but is slower in older individuals. · The QRS complexes are narrow unless there is preexistent bundle branch block, ventricular aberration, or preexcitation. · In AF, multiple independent reentrant wavelets are present within the atria. These reentrant wavelets may be precipitated by premature atrial complexes or spontaneous depolarizations originating from pulmonary veins as well as other large veins draining into the atria. · For AF to become sustained, the atria is usually enlarged and structural changes such as scarring and fibrosis are usually present. These structural changes in the atria provide a substrate for reentry. · The prevalence of AF increases with age. At age 50, approximately 0.5% have AF. This increases to more than 8% by age 80 years. The median age of a patient with AF is 75 years. The incidence of AF is higher among patients with congestive heart failure and high blood pressure, which can be reduced with angiotensin-converting enzyme inhibitors or with angiotensin receptor blockers. · AF and atrial flutter are the only two arrhythmias that increase the risk for stroke and thromboembolism. The thrombus is usually located in the left atrial appendage. Thrombus confined to the left atrial appendage can not be diagnosed by transthoracic echocardiography. Transesophageal echo is the best imaging modality that can detect a left atrial appendage thrombus. · Valvular AF:Valvular AF includes patients with AF associated with rheumatic mitral valve disease, especially those with mitral stenosis and patients with prosthetic mitral valve or previous mitral valve repair. These patients are high risk for stroke and should be adequately anticoagulated with warfarin. · Nonvalvular AF: Patients with AF who do not have any of these features have nonvalvular AF. The risk of stroke for patients with nonvalvular AF is low unless they have markers that increase their risk for thromboembolism. These markers come under the eponym of CHADS2 (Cardiac failure, Hypertension, Age >75 years, Diabetes, and Stroke). History of stroke or previous transient ischemic attack carries a risk that is twice that of the other risks features, thus a factor of 2 is added under Stroke. · Lone AF: When AF is not associated with any known cause or any evidence of cardiopulmonary disease in a patient younger than 60 years of age, lone AF is present. This is seen in up to 20% to 25% of all patients with persistent AF. Patients with lone AF should be identified because these patients are low risk for thromboembolism. · AF may be reversible and transient when it occurs acutely in the setting of pneumonia or other acute respiratory infections, acute myocarditis, pericarditis, thyrotoxicosis, pulmonary embolism, acute myocardial infarction, or after cardiac or noncardiac surgery. It may also be precipitated by excess intake of alcohol often called “holiday heart syndrome” and other metabolic abnormalities. AF may spontaneously convert to normal sinus rhythm if the cause is reversible and may not recur when these conditions are corrected or stabilized. · Symptoms of AF may vary from a completely asymptomatic patient to one with frank syncope. When the ventricular rate is unusually rapid exceeding 150 bpm, symptoms of hypotension, dizziness, even frank syncope, congestive heart failure, or myocardial ischemia may occur because of decreased cardiac output. The decreased cardiac output is due to loss of atrial contribution to left ventricular (LV) filling. The rapid ventricular rate also shortens diastole further decreasing ventricular filling. · AF can cause tachycardia mediated cardiomyopathy. It may precipitate heart failure and pulmonary edema in patients with LV dysfunction and stenotic valves including mitral stenosis especially when the ventricular rate is not controlled. · When AF is present, the most common underlying abnormality is usually hypertension or coronary artery disease. Other frequent underlying conditions associated with AF include cardiomyopathy, hyperthyroidism, valvular heart disease (especially mitral stenosis or insufficiency), chronic obstructive pulmonary disease, and pericarditis. · Congestive heart failure, regardless of etiology, is now increasingly recognized as a cause of AF. The use of angiotensin-converting enzyme inhibitors and blockers of the renin-angiotensin aldosterone system has been shown to decrease the incidence of AF in patients with heart failure as well as in patients with high blood pressure, especially those with LV hypertrophy. o Varying intensity of the first heart sound because of the varying R-R intervals. When the R-R interval is prolonged, the intensity of the first heart sound is softer. When the R-R interval is short, the intensity of the first heart sound is louder. o When a systolic murmur is present, AF may be useful in differentiating whether the heart murmur is outflow (aortic stenosis or functional murmur) or inflow (mitral regurgitation) in origin. If the intensity of the murmur increases after a long R-R interval, the murmur is outflow in origin. If the intensity of the murmur does not change following a long R-R interval, the murmur is due to mitral regurgitation. o Rate control: The ventricular rate should be adequately controlled in all patients with AF. o Rhythm control: AF should be converted to normal sinus rhythm with electrical cardioversion or pharmacologic therapy in selected patients with AF. o Prevention of thromboembolism: Anticoagulation is one of the cornerstones in the therapy of AF. It should be considered in all patients who are high risk for stroke. · The ventricular rate should always be adequately controlled in all patients with AF. ABCD are the drugs of choice for controlling the ventricular rate in AF as well as in atrial flutter (Amiodarone, Beta blockers, Calcium channel blockers, Digoxin). The drugs of choice are not necessarily in alphabetical order. Beta blockers, nondihydropyridine calcium channel blockers, and digoxin are effective for rate control. They are not effective in converting AF to normal sinus rhythm. They should not be given when there is preexcitation. Amiodarone is effective both for rate control and for rhythm control (conversion of AF to normal sinus rhythm) but has several side effects and is not approved by the Food and Drug Administration for rate control or for rhythm control in AF. This agent nevertheless is included as a therapeutic agent based on recommended guidelines and clinical efficacy reported in the literature. · The choice of the most appropriate agent for controlling the ventricular rate in AF in the acute setting depends on the clinical presentation. o Normal systolic function: In stable patients with normal systolic function, intravenous nondihydropyridine calcium channel blockers and beta blockers receive Class I recommendation for control of ventricular rate in AF. Intravenous digoxin or amiodarone also receive Class I recommendation when there is LV dysfunction and heart failure or when the use of other AV nodal blocking agents are inappropriate. § Diltiazem: Diltiazem is a nondihydropyridine calcium channel blocker. The initial dose is 0.25 mg/kg (or 15 to 20 mg) given IV over 2 minutes. The heart rate and blood pressure should be monitored carefully. The drug has a rapid onset of action and should control the ventricular rate within 5 to 10 minutes of administration. If the heart rate remains tachycardic 10 minutes after the initial bolus, a higher dose of 0.35 mg/kg (or 20 to 25 mg) is given IV similar to the first dose. The second dose may be more hypotensive than the initial dose and should be given more slowly. This will allow the blood pressure and heart rate to be monitored more carefully while the drug is being administered. When the heart rate is controlled, usually below 100 bpm, a maintenance dose of 5 to 15 mg/hour (usually 10 mg/hr) is infused. Diltiazem has a short half life of 3 to 4 hours, but becomes more prolonged when maintenance infusion is added. The IV maintenance dose is titrated according to the desired heart rate. An oral maintenance dose of diltiazem is started within 3 hours after the initial IV dose so that the IV infusion can be discontinued within 24 hours. The total oral dose is usually 1.5 times the expected 24-hour cumulative IV dose. A total of 120 to 360 mg of short-acting diltiazem is given orally in three to four divided doses. A long-acting preparation can be given once or twice daily. § Verapamil: Verapamil is another nondihydropyridine calcium channel blocker. The initial dose is 0.075 to 0.15 mg/kg (or 5 to 10 mg) given IV over 2 minutes. The same dose can be repeated after 15 to 30 minutes if needed. Verapamil has a longer duration of action of 4 to 12 hours and, unlike diltiazem, does not need a continuous maintenance IV infusion. It is more hypotensive and more negatively inotropic than diltiazem; thus, the patient should be carefully monitored especially if the patient is already on a beta blocker. The hypotension may respond to calcium gluconate given 1 gram IV. Oral maintenance dose is 120 to 360 mg daily in divided doses. A long-acting preparation can be given once daily. § Beta blockers: Beta blockers are preferred in patients with myocardial ischemia or thyrotoxicosis and also receive Class I recommendation for rate control. § Metoprolol: Metoprolol is a selective β1 blocker. The initial dose is 2.5 to 5 mg IV over 2 minutes up to three doses (maximum dose of 15 mg given within 15 minutes). This is followed by an oral maintenance dose of 25 to 100 mg (usually 50 mg) given twice daily. The oral dose is titrated according to the desired heart rate. § Atenolol: Atenolol is also a selective ß1 blocker. It does not carry indication for controlling the ventricular rate of AF, but is approved for use in hypertension and acute myocardial infarction. The initial dose is 5 mg IV over 5 minutes. A second dose may be given 10 minutes later if needed, for a total intravenous dose of 10 mg. This is followed by an oral dose of 50 mg 10 minutes after the last intravenous dose and another 50 mg 12 hours later. A maintenance oral dose of 50 mg is given once daily. The oral dose is titrated according to the desired heart rate. § Propranolol: This is a nonselective ß1 ß2 blocker. The initial dose is 0.15 mg/kg IV. Up to 10 mg is given slowly IV at 1 mg per minute. The IV dose is followed by an oral dose of 80 to 240 mg daily given in divided doses. The oral dose is titrated according to the heart rate. A long-acting preparation is also available and is given once daily. § Esmolol: This agent is ultra-short-acting with a half-life of 9 minutes. A loading dose is needed, which is 0.5 mg/kg (500 mcg/kg) infused over a minute. This is followed by an initial maintenance dose of 0.05 mg/kg/min (50 mcg/kg/minute) infused for 4 minutes. The patient is evaluated after 5 minutes if a higher maintenance dose is needed. The patient should be carefully monitored during infusion so that the appropriate maintenance dose can be adjusted, which can vary up to 60 to 200 mcg/kg/minute. See Appendix: Commonly Used Injectable Pharmacologic Agents for further dosing. § Digoxin: This agent is not the preferred agent when LV function is preserved. However, when there is hypotension (preventing the use of calcium channel blockers or beta blockers) or the patient has bronchospastic pulmonary disease (preventing the use of beta blockers) or patient has LV dysfunction or heart failure, this agent receives a Class I recommendation. It is not effective as monotherapy and is generally combined with other AV nodal blocking agents for rate control. Dosing is described under LV dysfunction. § Amiodarone: In patients with normal systolic function, amiodarone given intravenously receives a Class IIa recommendation for rate control when other AV nodal blocking agents are ineffective or inappropriate. It receives a Class IIb recommendation when given orally to control heart rate when other agents have been tried and are unsuccessful in controlling the ventricular rate at rest or during exercise. Dosing is described under LV dysfunction. o Patients with LV systolic dysfunction: In patients with heart failure, digoxin and amiodarone are the preferred agents. § Digoxin: Digoxin receives a Class I recommendation when given orally or intravenously when there is heart failure from LV systolic dysfunction. A loading dose is necessary and may vary. For rapid control of ventricular rate in the acute setting, the initial dose recommended by the ACC/AHA/ESC 2006 guidelines on the management of AF is 0.25 mg IV over 2 minutes every 2 hours. The dose should not exceed 1.5 mg IV within 24 hours. Maintenance dose is 0.125 to 0.375 mg daily given intravenously or orally. For heart rate control in a nonacute setting, an oral dose of 0.5 mg daily may be given for 2 to 4 days followed by an oral maintenance dose of 0.125 to 0.375 mg daily. Digoxin has a very slow onset of action (1 hour or more) and its maximal effect is not until after 6 hours. It is usually not a very effective agent in controlling the ventricular rate in AF when used as monotherapy and receives a Class III recommendation when given as the sole agent in patients with paroxysmal AF. It may be effective in controlling heart rates at rest as well as in individuals who are sedentary but control of the rate of atrial fibrillation is lost during physical activity or in conditions associated with adrenergic stress such as febrile illnesses, hyperthyroidism, or exacerbations of chronic obstructive pulmonary disease. § Amiodarone: Intravenous amiodarone receives a Class I recommendation to control the ventricular rate in patients with AF with heart failure. In the acute setting when rate control is necessary, 150 mg is given IV over 10 minutes followed by a maintenance infusion of 1 mg/minute IV for 6 hours and 0.5 mg/minute IV for the next 18 hours. The oral dose has a very slow onset of action and is more appropriate to use in nonacute setting. The oral dose is 800 mg daily in divided doses for 1 week. Another option is to give a lower dose of 600 mg daily in divided doses for 1 week or 400 mg daily in divided doses for 4 to 6 weeks. Any of these regimens is followed by long-term oral maintenance dose of 200 mg daily. Amiodarone affects the pharmacokinetics of warfarin, verapamil, and digoxin. The dose of these pharmacologic agents should be reduced when amiodarone is started. § Other agents: Intravenous injection of nondihydropyridine calcium channel blockers and beta blockers may be given cautiously for rate control when there is LV dysfunction. These agents however are contraindicated (Class III) when the patient is acutely decompensated. Diltiazem has a shorter half-life and is less negatively inotropic than verapamil and may be more tolerable. o WPW syndrome: In patients with WPW syndrome, the use of AV nodal blocking agents to control ventricular rate during AF is inappropriate and may be dangerous. Inhibition of the AV node with any AV nodal blocking agents such as calcium channel blockers, beta blockers, or digitalis will allow atrial fibrillatory impulses to pass more efficiently through the bypass tract, which may result in ventricular fibrillation. Instead of AV nodal blockers, antiarrhythmic agents that increase the refractory period of the bypass tract such as type IA agents (procainamide) or drugs that can inhibit both AV node and bypass tract such as type IC and type III agents (ibutilide or amiodarone), may be given intravenously to hemodynamically stable patients to control the ventricular rate. Otherwise, the AF should be converted to normal sinus with electrical cardioversion. The treatment of AF in patients with WPW syndrome is further discussed in Chapter 20, Wolff-Parkinson-White Syndrome. · Nonpharmacologic control of ventricular rate in AF: The following are used only when pharmacologic agents are not effective in controlling the ventricular rate, especially when there is tachycardia-mediated cardiomyopathy. o AV nodal ablation: If the ventricular rate in AF can not be controlled with AV nodal blocking agents or other antiarrhythmic agents, radiofrequency ablation of the AV node combined with insertion of a permanent ventricular pacemaker is an option. Before AV nodal ablation is considered, the patient should be tried on medications and performed as a last resort especially in patients with tachycardia-mediated cardiomyopathy. o Pulmonary vein isolation: Isolation of the pulmonary veins may be performed either surgically or with radiofrequency ablation to maintain normal sinus rhythm (see Rhythm Control in this chapter) rather that for control of ventricular rate during AF. · Rate control: The following is a summary of pharmacologic agents recommended by the ACC/AHA/ESC guidelines for rate control in AF (Table 19.1). · Rhythm control or conversion of AF to normal sinus rhythm is not necessary in all patients with AF. In the AFFIRM (Atrial Fibrillation Follow-up Investigation of Rhythm Management) and RACE (Rate Control vs. Electrical Cardioversion for Persistent Atrial Fibrillation) trials, there was no difference in mortality or incidence of stroke among patients with AF who were treated aggressively with electrical cardioversion and maintenance of the AF to normal sinus rhythm with antiarrhythmic agents when compared with patients with AF who were not cardioverted and were given only AV nodal blocking agents to control the ventricular rate. Both groups were anticoagulated. Thus, rhythm control in patients with AF should be individualized and should be reserved for patients who are symptomatic because quality of life can be improved, especially among patients with low cardiac output from LV dysfunction. The table summarizes the doses of pharmacologic agents recommended by the American College of Cardiology/American Heart Association/European Society of Cardiology 2006 practice guidelines for control of ventricular rate in AF. Any of these agents may be given to patients with normal systolic function although in patients with left ventricular dysfunction, especially in patients with acute decompensated heart failure, only digoxin or amiodarone are the preferred agents. AF, atrial fibrillation; IV, intravenous. · Methods of converting AF to normal sinus rhythm: Rhythm control or conversion of AF to normal sinus rhythm can be achieved with pharmacologic therapy or electrical cardioversion. Conversion of AF to normal sinus rhythm carries the risk of thromboembolization whether the conversion is spontaneous, electrical, or pharmacologic. The risk is increased if the duration of the AF is >48 hours. The longer the duration of AF, the higher the risk of thromboembolization because the atria will remain paralyzed even after the rhythm has converted to normal sinus. This risk is highest immediately after cardioversion, when AF has converted to normal sinus rhythm. Even among patients with negative transesophageal echocardiogram, atrial thrombi may develop after cardioversion from atrial stunning resulting in stagnant flow in the atria and left atrial appendage. · Spontaneous conversion: Spontaneous conversion of AF to normal sinus rhythm can occur in a large number of patients with acute onset AF. Spontaneous conversion occurs most frequently during the first 24 to 48 hours. The chance of spontaneous conversion to normal sinus rhythm becomes less and less as the duration of AF becomes longer. The chance of spontaneous conversion is significantly less when the duration of AF is more than 7 days. Additionally, the efficacy of antiarrhythmic agents in converting AF to normal sinus rhythm also becomes markedly diminished if the patient is in AF for more than 7 days. · Pharmacologic therapy: The use of drugs to convert patients with AF to normal sinus rhythm is simpler when compared with electrical cardioversion because it does not require IV sedation. They are most effective when given within 7 days of AF onset. Pharmacologic cardioversion however is less effective than electrical cardioversion. The toxic effect of these agents is also a major issue since most of these agents are proarrhythmic. Among the pharmacologic agents that have been shown to be effective in converting AF to normal sinus rhythm are type IA agents (procainamide, quinidine, and disopyramide), type IC agents (propafenone and flecainide), and type III agents (ibutilide, dofetilide, and amiodarone). When any of these agents are given to convert AF to normal sinus rhythm, the patient should be hospitalized. The only exception is amiodarone, which is the least proarrhythmic and can be initiated orally in the outpatient setting. Types IA and IC agents can potentially cause AF to convert to atrial flutter with one to one conduction across the AV node. An AV nodal blocker such as a beta blocker or a nondihydropyridine calcium channel blocker therefore should be given at least 30 minutes before these agents are administered. The pharmacologic agent of choice to terminate AF to normal sinus rhythm will depend on the duration of the AF as well as the presence or absence of LV systolic dysfunction. o AF of <7 days' duration: According to the ACC/AHA/ESC 2006 guidelines for the management of patients with AF, the following agents have been proven effective for pharmacological conversion of AF to normal sinus rhythm when the AF is <7 days' duration. These agents can be given orally or intravenously. Agents that are most effective include Class IC agents (flecainide or propafenone) and Class III agents (dofetilide or ibutilide). These agents carry a Class I recommendation for pharmacologic conversion of AF to normal sinus rhythm. Less effective is amiodarone, which carries a Class IIa recommendation. Other antiarrhythmic agents such as Class IA agents (quinidine, procainamide, and disopyramide) are less effective and carry a Class IIb recommendation. The use of sotalol and digoxin is not recommended and should not be administered for conversion of AF to normal sinus rhythm (Class III recommendation). o Preserved systolic function: There are several agents that can be used to convert AF to normal sinus rhythm when LV systolic function is preserved. o Flecainide: This agent receives Class I recommendation and can be given orally or intravenously. The oral dose for flecainide is 200 to 300 mg given once. The oral dose should not be given out of hospital for the patient to self administer as a “pill in the pocket strategy” unless the drug has been tried and proven to be safe and effective during initial hospitalization. An AV nodal blocker such as a calcium channel blocker or a beta blocker should be given at least 30 minutes before flecainide is given to prevent rapid ventricular rates from occurring should the rhythm convert to atrial flutter. The IV dose is 1.5 to 3.0 mg/kg given over 10 to 20 minutes. The intravenous preparation is not available in the United States. o Propafenone: The drug also receives a Class I recommendation and can be given orally or intravenously. The oral dose is 600 mg given once. The IV dose is 1.5 to 2.0 mg/kg given over 10 to 20 minutes. The intravenous preparation is not available in the United States. The success rate varies from 56% to 83%. Similar to flecainide, the agent can be prescribed for self-administration by the patient as a “pill in the pocket strategy” only after initial therapy in the hospital has shown that the drug is safe and effective and the patient does not have any evidence of sick sinus syndrome or structural cardiac disease. AV nodal blockers are routinely given as background therapy in AF. Otherwise, if the patient is not on AV nodal blocker, it should be given at least 30 minutes before taking a type IC agent to prevent one to one conduction across the AV node should the patient develop atrial flutter. o Ibutilide: The drug is available only intravenously and receives a Class I recommendation. The drug is given over 10 minutes as a 1 mg dose, diluted or undiluted. The dose is repeated after 10 minutes if the rhythm has not converted. o Dofetilide: The drug is given only orally and receives a Class I recommendation. Its use is restricted to cardiologists who are allowed access to this agent. Initial dosing is based on kidney function and is contraindicated in patients with severe renal dysfunction (creatinine clearance of <20 mL/minute). In patients with normal renal function (creatinine clearance >60 mL/minute), the dose is 500 mcg twice daily. Maintenance dose is 500 to 1,000 mcg daily. The QT interval should be carefully monitored during therapy. o Amiodarone: The drug can be given intravenously or orally and receives a Class IIa recommendation. The IV dose is 5 to 7 mg/kg over 30 to 60 minutes followed by 1.2 to 1.8 g per day of continuous infusion or in divided oral doses until a total dose of 10 g is given. The maintenance dose is 200 to 400 mg per day. The oral dose is given only if immediate conversion of AF to normal sinus rhythm is not essential. The oral in-hospital dose is 1.2 to 1.8 g/day in divided doses until 10 g is given. Maintenance dose is 200 is 400 mg/day. Another option is to give 30 mg/kg as single dose. Amiodarone is the only antiarrhythmic agent that can be initiated without hospitalizing the patient. In outpatients, a smaller dose of 600 to 800 mg is given orally daily in divided doses until a total of 10 g is given. This is followed by a lower maintenance dose of 200 to 400 mg a day. Amiodarone enhances the effect of warfarin and digoxin. The doses of both agents should be reduced when amiodarone is initiated. o Quinidine: Quinidine is given only orally and receives a Class IIb recommendation. The dose is 0.75 to 1.5 g in divided doses over 6 to 12 hours. The drug is combined with an AV nodal blocker to prevent increase in ventricular rate before AF converts to normal sinus. The drug can prolong the QT interval and can cause torsades de pointes. If patient is on digoxin, serum levels should be carefully monitored because quinidine increases the levels of digoxin, which can result in digitalis toxicity. o Left ventricular (LV) dysfunction: When LV dysfunction (LV ejection fraction ≤40%) or congestive heart failure is present, only amiodarone and dofetilide (both type III agents) are the preferred agents for conversion of AF to normal sinus rhythm. These are the least negatively inotropic antiarrhythmic agents. o Amiodarone: Loading dose is described above. The maintenance dose is 100 to 400 mg daily. o Dofetilide: The drug is given orally and its use is restricted to cardiologists who are familiar with the use of this agent. Dosing is described previously. o AF of more than 7 days' duration: When AF is more than 7 days' duration, only Class III agents (amiodarone, ibutilide, and dofetilide) are effective and are the only antiarrhythmic agents recommended. Most patients with AF of more than 7 days' duration have persistent AF. Class IA and Class IC agents are less effective and carry a Class IIb recommendation. According to the ACC/AHA/ESC 2006 guidelines for the management of patients with AF, sotalol and digoxin may be harmful and are not recommended for pharmacologic conversion of AF to normal sinus rhythm regardless of the duration of AF. · Rhythm control: The following is a summary of pharmacologic agents for rhythm control according to the ACC/AHA/ESC practice guidelines for management of patients with AF (Table 19.2). o Electrical or direct current cardioversion: This procedure is performed under intravenous sedation. If the AF is more than 48 hours' duration, DC cardioversion should not be performed until after the patient is adequately anticoagulated for a minimum of 3 weeks. If the need for conversion to normal sinus rhythm is more immediate, electrical cardioversion can be carried out if a transesophageal echocardiogram can be performed and no evidence of intracardiac thrombi can be demonstrated. § Electrical cardioversion is the most effective in converting AF to normal sinus rhythm. Most patients will need an initial energy setting of 200 joules for conversion. The energy setting is increased gradually if the initial shock is unsuccessful. The shock is synchronized with the QRS complex to prevent the delivery of the shock during the vulnerable phase of the cardiac cycle, which can result in ventricular fibrillation. Devices that deliver direct current cardioversion with biphasic waveform have been shown to be more effective than devices that deliver the monophasic waveform. § The patient should be adequately anticoagulated and should preferably be on antiarrhythmic agent before electrical cardioversion is performed. o Nonpharmacologic therapy: This is another option in converting patients with AF especially in symptomatic patients with recurrent AF who are not responsive to medical therapy. § Surgical ablation: Maze procedure is performed by making atrial incisions at certain critical geographic location in the atria so that AF will not become sustained. This is usually performed in patients with AF in conjunction with other cardiac surgical procedures such as replacement or repair of mitral valve or during coronary bypass surgery. § Catheter ablation: This procedure involves isolation of the pulmonary veins similar to a surgical maze procedure but is performed with catheterization techniques. The pulmonary veins are usually the site of ectopic foci that can precipitate AF. The table summarizes the doses of pharmacologic agents recommended by the American College of Cardiology/American Heart Association/European Society of Cardiology practice guidelines for conversion of AF to normal sinus rhythm. In patients with left ventricular dysfunction, only amiodarone and dofetilide are the preferred agents. · AF is a common cause of stroke in the elderly. The use of antithrombotic agents therefore is one of the cornerstones in the therapy of AF and is the standard of care in preventing strokes in patients with AF. Patients with AF who are high risk for stroke should be identified so that they can be protected with adequate anticoagulation. This is regardless whether the AF is paroxysmal, persistent, or permanent. Similarly, patients with AF who are low risk for stroke should also be identified so that they do not have to be exposed to the side effects of anticoagulation. § Valvular AF: Patients with valvular AF are very high risk for developing stroke. Valvular AF includes patients with rheumatic mitral stenosis as well as patients with prosthetic mitral valve or previous mitral valve repair. Their risk for thromboembolism is approximately 15 to 20 times that of patients with AF but without these cardiac abnormalities. Patients with mitral prosthetic valves should be anticoagulated with warfarin to an International Normalized Ratio (INR) of 2.5 to 3.5. Patients with mitral stenosis and previous mitral valve repair should be anticoagulated to an INR of 2.0 to 3.0. § Previous history of thromboembolism: Patients with AF with previous history of stroke, transient ischemic accident (TIA), or other forms of thromboembolism are also at high risk for developing stroke. Their risk is increased 2.5 times those with AF but without previous history of thromboembolism. These patients should also be anticoagulated with warfarin to an INR of 2.0 to 3.0.
o Lowest risk of stroke: Patients with AF who are lowest risk for stroke (≤2% per year) are patients with lone AF. The ACC/AHA/ESC 2006 guidelines on AF defines lone AF as patients who are <60 years of age and have no evidence of cardiac or pulmonary disease. These patients are not hypertensive and have normal echocardiograms and are low risk for thromboembolism. The guidelines recommend that these patients should be on aspirin, 81 to 325 mg daily although they also have the option of receiving no therapy. Among patients <60 years of age with heart disease but none of the risk features for thromboembolism, these patients are also low risk for stroke but should be on aspirin 81 to 325 mg daily. These patients do not need to be anticoagulated with warfarin. o Intermediate or moderate risk for stroke: Some patients with nonvalvular AF (no prosthetic mitral valve or rheumatic mitral stenosis) may have risk features for stroke that are intermediate (3% to 5% per year) when compared with patients in AF, but without these risk features. These intermediate risk markers come under the eponym of CHADS2. § S2 = Stroke, TIA, or previous history of thromboembolism. § In nonvalvular AF, each of the above risk features increases the incidence of stroke and receives a weight of one except stroke/TIA or previous history of thromboembolism, which gives the patient two times the risk of the other risk features and is thus equivalent to a weight of 2, thus S2. § CHADS2 serves as a useful guide in determining the intensity of antithrombotic therapy in patients with nonvalvular AF. o One intermediate risk feature: Any one of the above risk features: cardiac failure, hypertension, advanced age, and diabetes (CHAD) but not stroke or TIA, is an intermediate risk for thromboembolism. These patients have the option of either taking aspirin 81 to 325 mg daily or warfarin monitored to an INR of 2 to 3.
o Previous history of stroke or two or more risk factors: Patients with history of stroke or TIA or with 2 or more intermediate risk features should receive warfarin and should be anticoagulated to an INR of 2.0 to 3.0. · Anticoagulation during electrical or pharmacologic cardioversion: If cardioversion is planned in patients with AF of more than 48 hours' duration or the duration of AF is not known, these patients should be anticoagulated for at least 3 to 4 weeks before electrical or pharmacologic cardioversion is attempted. If immediate cardioversion is planned, the patient should undergo transesophageal echocardiography to exclude thrombus in the left atrial appendage. If a thrombus is present, cardioversion is delayed and the patient is fully anticoagulated for at least 3 to 4 weeks before electrical cardioversion can be performed. If a thrombus is not present, intravenous heparin is given and electrical cardioversion is performed under intravenous anesthesia. Anticoagulation is continued after successful cardioversion for at least 3 to 4 weeks preferably 12 weeks. This includes patients with lone AF who undergo cardioversion. In many patients who are successfully cardioverted, the normal sinus rhythm in the ECG is often not accompanied by effective atrial contraction. This electromechanical dissociation may persist for several days or weeks. Thus, anticoagulation should be continued. The risk of stroke is similar among patients undergoing pharmacologic or electrical cardioversion and is highest within 3 days after the procedure. Among patients developing strokes after cardioversion, all episodes occurred within 10 days after the procedure. · Warfarin is the standard treatment for anticoagulating patients with AF. Aspirin does not equal the protection given by warfarin except in patients with lone AF or those with a 0 to 1 risk factor for stroke. · Table 19.3 summarizes the use of antithrombotic agents in patients with AF. · AF is more common in the elderly and is an independent risk factor for death. The mortality in patients with AF is twice that of patients in normal sinus rhythm. This increase in mortality is associated with the severity of the underlying heart disease. · AF is associated with increased risk of stroke and heart failure. It is a common cause of morbidity in elderly patients with approximately 15% of all thromboembolic strokes from AF. · In patients younger than 60 years of age without clinical or echocardiographic evidence of structural heart disease or chronic pulmonary disease, AF is generally benign. The risk of stroke, however, increases above this age or when associated with conditions that are known to increase the risk for stroke. The table summarizes the antithrombotic agents recommended by the 2006 American College of Cardiology/American Heart Association/European Society of Cardiology guidelines for prevention of stroke in patients with AF. AF, atrial fibrillation; IV, intravenous; INR, International Normalized Ratio. The Atrial Fibrillation Follow-up Investigation of Rhythm Management (AFFIRM) Investigators. 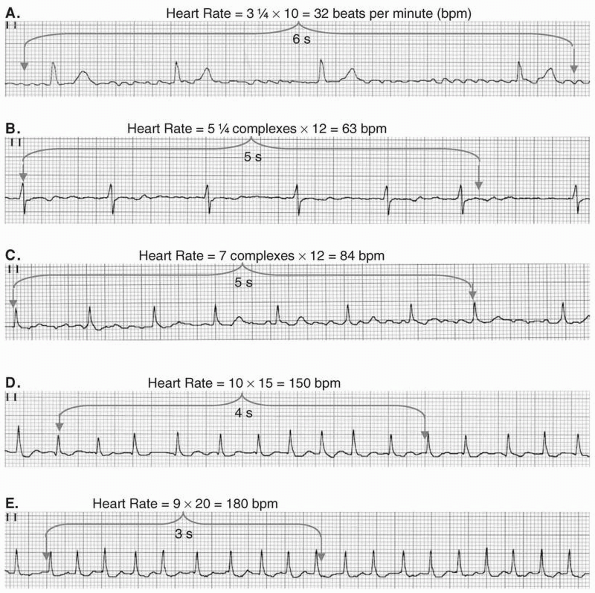 A comparison of rate control and rhythm control in patients with atrial fibrillation. N Engl J Med. 2002;347:1825-1833. Blomstrom-Lundqvist C, Scheinman MM, Aliot EM, et al. ACC/AHA/ESC Guidelines for the management of patients with supraventricular arrhythmias—executive summary. A report of the American College of Cardiology/American Heart Association Task Force on Practice Guidelines, and the European Society of Cardiology Committee for Practice Guidelines (Writing Committee to Develop Guidelines for the Management of Patients with Supraventricular Arrhythmias). J Am Coll Cardiol. 2003;42: 1493-1531. Botteron GW, Smith JM. Cardiac arrhythmias. In: Carey CF, Lee HH, Woeltje KF, eds. The Washington Manual of Medical Therapeutics. 29th ed. Philadelphia: Lippincott Williams & Wilkins; 1998:130-156. Capucci A, Villani GQ, Piepoli MF. Reproducible efficacy of loading oral propafenone in restoring sinus rhythm in patients with paroxysmal atrial fibrillation. Am J Cardiol. 2003; 92:1345-1347. Fuster V, Ryden LE, Cannom DS, et al. ACC/AHA/ESC 2006 guidelines for the management of patients with atrial fibrillation—executive summary; a report of the American College of Cardiology/American Heart Association Task Force and the European Society of Cardiology Committee on Practice Guidelines and the European Society of Cardiology Committee for Practice Guidelines (Writing Committee to Revise the 2001 Guidelines for the Management of Patients with Atrial Fibrillation). J Am Coll Cardiol. 2006;48:854-906. Gage BF, Waterman AD, Shannon W, et al. Validation of clinical classification schemes for predicting stroke: results from the National Registry of Atrial Fibrillation. JAMA. 2001;285: 2864-2870. Rockson SG, Albers GW. Comparing the guidelines: anticoagulation therapy to optimize stroke prevention in patients with atrial fibrillation. J Am Coll Cardiol. 2004;43:929-935. Roy D, Talajic M, Nattel S, et al. Rhythm control versus rate control for atrial fibrillation and heart failure. N Engl J Med. 2008;358:2667-2677. Sherman DG, Kim SG, Boop BS, et al. Occurrence and characteristics of stroke events in the atrial fibrillation follow-up investigation of sinus rhythm management (AFFIRM) study. Arch Intern Med. 2005;165;1185-1198. Singh BN, Singh SN, Reda DJ, et al. Amiodarone versus sotalol for atrial fibrillation. N Engl J Med. 2005;352:1861-1872. Van Gelder IC, Hagens VE, Bosker HA, et al. A comparison of rate control and rhythm control in patients with recurrent persistent atrial fibrillation. N Engl J Med. 2002;92:1834-1840.
van Walraven WC, Hart RG, Wells GA, et al. A clinical prediction rule to identify patients with atrial fibrillation and a low risk for stroke while taking aspirin. Arch Intern Med. 2003;163: 936-943.